In post–World War I England, Lady Phoebe Renshaw and her lady’s maid, Eva Huntford, encounter an uncharitable killer at a charity luncheon sponsored by a posh school for girls . . .
Good deeds build good character, and good character is what the Haverleigh School for Young Ladies is all about. Lady Phoebe—with the tireless assistance of Eva—has organized a luncheon at the school to benefit wounded veterans of the Great War, encouraging the students to participate in the cooking and the baking. 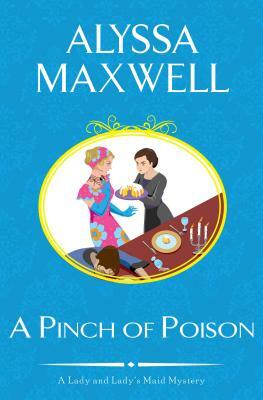 But too many cooks do more than spoil the broth—they add up to a recipe for disaster when the school’s headmistress, Miss Finch, is poisoned. The girls at Haverleigh all come from highly respected families, none of whom will countenance their darling daughters being harassed like common criminals by the local police. So Lady Phoebe steps in to handle the wealthy young debutantes with tact and discretion, while Eva cozies up to the staff. Did one of the girls resent the headmistress enough to do her in? Did a teacher bear a grudge? What about the school nurse, clearly shell shocked from her service in the war? No one is above suspicion, not even members of the school’s governing body, some of whom objected to Miss Finch’s “modern” methods. But Lady Phoebe and Eva will have to sleuth with great stealth—or the cornered killer may try to teach someone else a lethal lesson. Praise for MURDER MOST MALICIOUS, the first Lady and Lady’s Maid Mystery!